Whether you are a newbie, an enthusiast or a professional sewist, having your sewing machine jam in the middle of a project can be quite a frustrating experience. The moment when no sound and movement happens once you press the pedal is one we all dread, as well as noting how your machine makes a few stitches right before getting all tangled up during the project. This is why it is essential that you understand what the underlying reason behind this jamming is, so that you can do everything possible to prevent further instances, as well as know how to act quickly without getting panicked or angry and efficiently to resolve this annoying problem as soon as it happens. However certain you are that the problem with the machine is most likely due to a huge tangled mess of thread in the bobbin underneath the fabric, the most common reason for the jamming is usually the lack of sufficient tension in the upper thread. This simple problem will case the machine to get jammed due to the insufficient tension necessary for pulling up the thread through the fabric you are sewing. All you need to do is go ahead, lift the presser foot and re-thread your needle in accordance to the instructions of the manufacturer. This can occur due to dust, lint or other debris getting stuck inside the machine. This is why you need to periodically take the time to clean out your machine from any dust or gunk stuck during your work on your various sewing projects. If this type of jamming occurs, turn the stitching machine off, go ahead and un-thread it and perform a thorough cleaning of the entire machine, especially its working mechanisms. Use a small brush or blow out any stuck lint, dust or others. Plus, make sure that you perform regular oiling of the metal parts of your machine for a seamless performance. Use canned air for blowing out any residues from the bobbin area. To prevent further such occurrences, schedule monthly cleaning and oiling of your machine and if you sew on a daily basis, you probably would want to perform the cleaning and maintenance even more often. Often, your sewing machine will suddenly stop working due to a bent or broken needle which stops the thread from going through the fabric. Stop work and carefully inspect your needle for any deformities or breakage, and if you see any – replace it with a new one. Make sure you are using the proper type and size needle for the machine and for the particular project too, because sometimes this can be the underlying cause the annoying jamming as well. 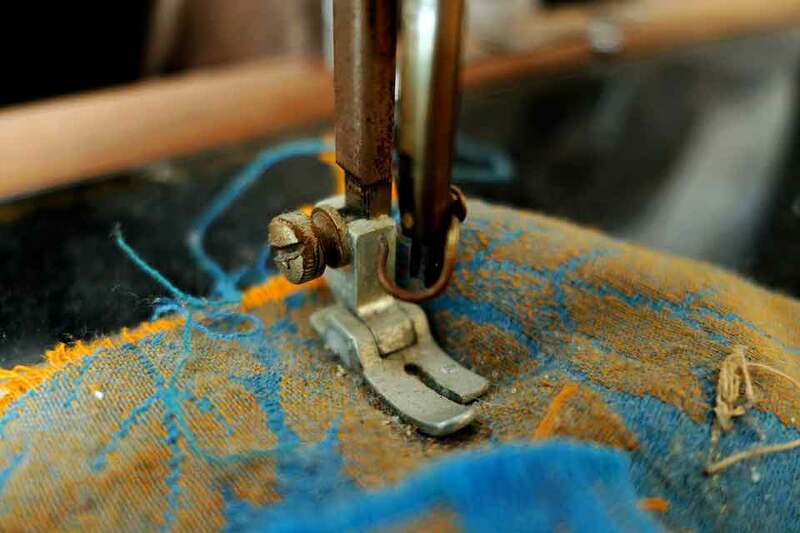 Another relatively common reason for the malfunctioning of sewing machines is when the small teeth located underneath the needle and presser foot which are responsible for pulling the fabric through during the sewing process, also known as feed dogs, are not working properly. The reason for the problem could be lint, dust and other debris getting stuck in their mechanism. Stop work, lift the presser foot and thoroughly clean the fee dogs from any debris. Also, make sure that they are lifted up in a raised position allowing for a proper grip of the fabric. Another useful thing to try is to ensure that the presser foot is not too low above the fed dogs which is causing the problems with the fabric moving freely during the sewing process. Adjust them properly before returning to your project. Do not underestimate the quality of the thread you use for your sewing projects, because often lower quality thread can cause a number of bothersome problems for your machine and for your project. Thread of a lower quality can cause the shredding of lint which can get stuck in the mechanics of your machine and cause it to get jammed. Also, bad quality thread is prone to breaking and knotting which too will hinder your sewing machine’s performance and will slow down and even ruin your project. Make sure you invest in some good quality thread of the type recommended by the manufacturer. It may cost more than the lower quality thread, but it will ensure that your work is seamless and that the machine performs at its best while you are working on your next project. If everything listed above fails, consider getting your sewing machine for a repair, or get a new simple model from our list here: hellosewing.com/beginner-sewing-machines/ We have handpicked all models featured there.